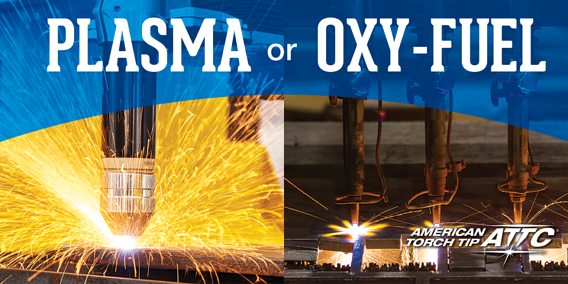 A variety of factors influence whether automated Plasma cutting or Oxy-fuel cutting will produce the best results for your operation. Here are a few things to consider when making that decision. First, consider the material you’ll be cutting. Oxy-fuel cuts ferrous (iron-containing) steels, but does not cut aluminum or stainless steel. Automated Plasma can cut any electrically conductive metal, including stainless steel, steel, aluminum and copper. If you’re cutting either stainless steel or aluminum, then the clear choice is Plasma. Another factor to consider is the thickness of what you’ll be cutting. Automated Plasma generally works on mild steel 2 inches thick or less and is particularly effective on thinner materials. High-performance Plasma can cut thicker material with good results. Oxy-fuel, on the other hand, can cut ferrous steels up to two feet thick. Based solely upon the material, composition and thickness, then, you might have a clear answer. However, if you’re looking to cut ferrous steel in the one-to-two-inch range, the answer is less certain. Ultimately, your choice should be made after a deeper look into your cutting needs. An average automated Oxy-fuel cutting system costs around ten times less upfront than the average automated Plasma system. While that gap can be intimidating if you’re leaning toward Plasma, it doesn’t tell the whole story. Plasma cuts more quickly than Oxy-fuel, and this speed difference can affect both the productivity of the cutting system and the cost to operate it. At a 1-inch thickness, for instance, Plasma is two to four times faster than Oxy-fuel. As the thickness decreases, that speed gap widens even further. But as the thickness increases, the speeds begin to level out. That’s why even though the operating cost of Oxy-fuel is lower on its face, the increased efficiency of an automated Plasma system, particularly for thinner cuts, means that the costs are distributed over more parts. In addition to being faster, Plasma produces better, cleaner cuts that result in less dross and less need for secondary operations like grinding. The simple answer is it depends on the individual needs of your business. If you’re only cutting occasionally, and you don’t have a need to cut stainless steel, then Oxy-fuel makes sense. It’s cheaper and quicker to set up, and it’s can cut through thick metal. However, if you’re operating more like an assembly line, or if productivity matters to you at all, Plasma has clear advantages. It’s faster, can cut a wider range of metals, and requires less secondary cleanup to remove dross.